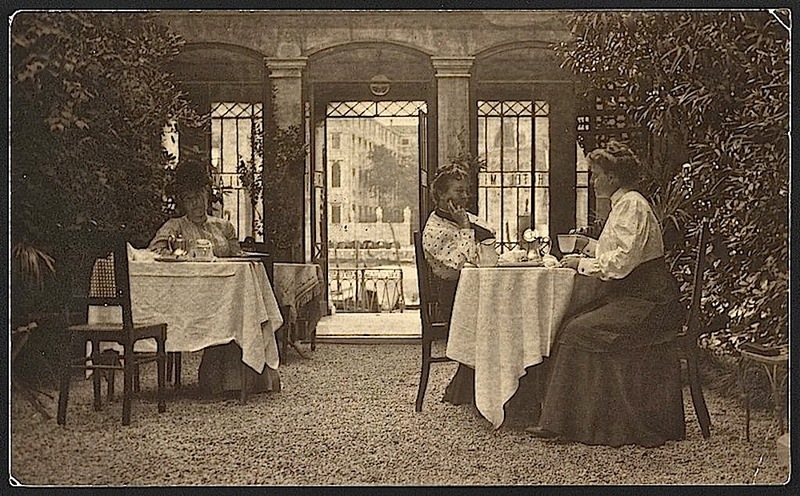 Professional photographers Gertrude Käsebier and Frances Benjamin Johnston eating together on a hotel patio in Venice, Italy, 1905, via Library of Congress Prints and Photographs Division. Johnston — from Washington, D.C. — and Käsebier — from New York City — had traveled across the Atlantic at the invitation of the Royal Photographic Society of Great Britain. On the same trip, they also visited France, Switzerland, and Italy. The older and more successful Gertrude Käsebier had been born in a log cabin in Iowa in 1852. After marrying* a successful businessman of aristocratic German origins and having three children, she began to study photography at the Pratt Institute in Brooklyn. Within ten years, by the late 1890s, she had opened a studio on Fifth Avenue in Manhattan. At the time of this photo, she was “one of the best known photographers in the United States,” according to her Library of Congress biography. Her portraits of women and children were shown in major exhibitions and won her critical acclaim and financial independence. Käsebier’s ability to discern the complexities of situations helped her achieve conflicting goals. She aimed to be associated with fine art and the upper classes but she enjoyed the relatively déclassé technical art of photography. She also wanted to earn a living, a desire that brought criticism from [Alfred] Stieglitz for sacrificing art to commerce, while society frowned on women participating in any kind of business. At a time when a salesman challenged women’s right to purchase high quality photographic equipment, Käsebier encouraged women to enter the professional world. For example, she befriended and supported Frances Benjamin Johnston, whose ambition and need to earn an income may have surpassed her own. Kasebier worked until the mid-1920s, when she turned her studio over to her daughter, Hermine. Johnston had a long career as well, ultimately specializing in architectural and garden photography. She retired at age 81 in 1945. *It was an unhappy marriage and inspired her to make this photo. Love the image and the story, is appreciated learning about encouraging women to become skilled professionals. Thanks for the Sunday post! I have such respect for their resolve to be ambitious about their careers at a time when that could bring so much criticism for a woman. I wish I could eavesdrop on the conversation — and peer into the thoughts of the woman sitting by herself. The photo looks like an excellent writing prompt. The woman by herself looks a bit put out at being made part of the picture.